I was recently invited to participate in a career fair at my son's elementary school. I was excited to participate and share my passion for speech-language pathology with them! I did not learn what speech-language pathology was until I was in college (gasp!) but am so thankful that I was blessed to be housed in the dorms across from a SLP major. Watching her creatively develop materials for her client in her clinical inspired me to take an introductory course to check out what speech-language pathology was all about. The rest is history! In speaking with my son, one suggestion that he had was for the presentation to be interactive and engaging. I couldn't agree more so I decided to create an "Escape the Speech Room" activity that would introduce the students to various aspects of communication with missions in Articulation, Language, Fluency, Voice and Pragmatics! The students had a blast and they learned a bunch along the way! Knowing that the students would likely be listening to various presentations throughout the day, I wanted to give them the opportunity to get up and move while learning in the process. Escape the Speech Room was broken up into 5 “missions” which were broken up into centers. Each of the 5 Missions reflected on an area within our scope of practice: Articulation, Language, Voice, Fluency, and Pragmatics. Each mission contained a Debriefing Sheet with information about that particular area. It also included a list of materials that they needed as well as a description of their mission. Each mission uncovered a key to the help unlock the individual padlocks on the box. Once the groups solved their missions, they came together to learn about some of our work settings and decode the final clue. 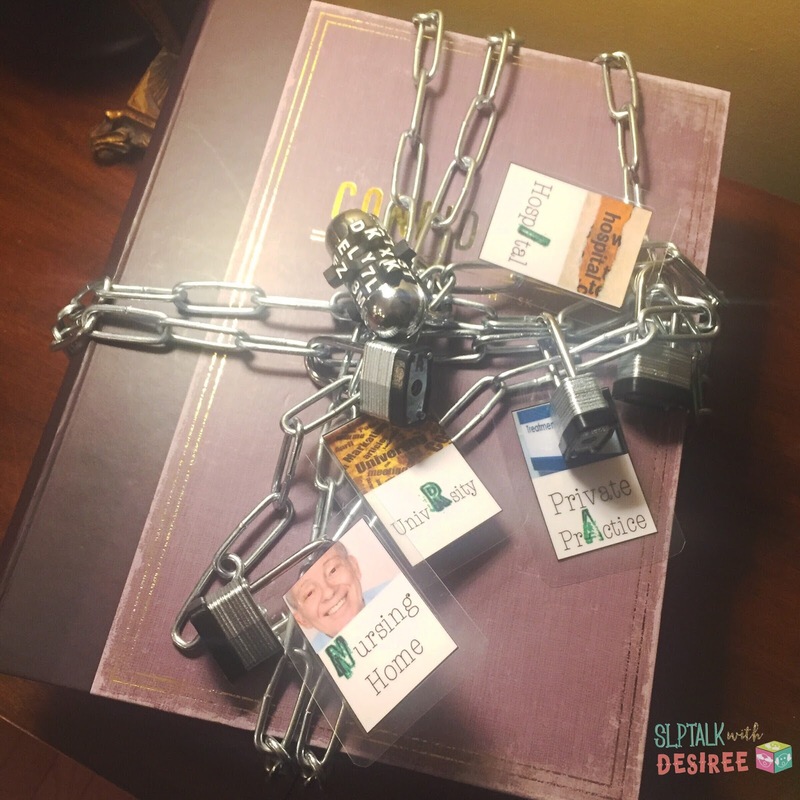 The individual padlocks all contained a card with a setting an SLP may work in. The students used those cards to collectively determine what the passcode to the final word lock was. When the students completed their challenge, they filled out a Reflections sheet to show what they learned and share it with the other students. This allowed students to learn about the different centers or areas of speech-language pathology by reading their fellow classmates' reflections. PLEEAASSE make it available or sell.on TPT. My school has a career day coming up May 19th and I would love to copy your idea. Yep, I went there, I said COPY! Hello! I just signed up for your newsletter and am hoping I did not miss your email about your escape room! I would LOVE to do this activity for BSHM! Is this available in your TPT store?? This is amazing!!! !